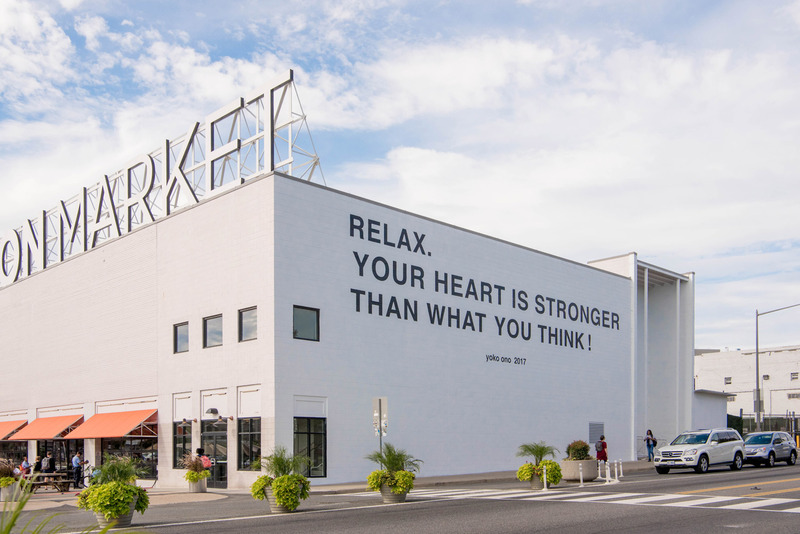 Hirshhorn in the City is a new initiative to bring international contemporary art beyond the museum walls, and connect artists and curators with the city’s creative communities. We seek to spark inspiration in the everyday, experimenting with projects, partnerships and installations in D.C. neighborhoods that create more ways to bring people and ideas together. In conjunction with the Hirshhorn Museums’ largest technology exhibition to date, the Mexican Cultural Institute of the Embassy of Mexico in Washington, D.C. will present the Washington debut of Rafael Lozano-Hemmer’s 2011 work, Voice Array, on loan from the Hirshhorn’s collection, a gift of the Heather and Tony Podesta Collection in 2014. On view from Oct. 31 through Jan. 31, 2019, the interactive work records participants’ voices and converts them into flashing lights that come together to visually and aurally depict the cumulative contributions of the last 288 visitors. Voice Array x Mexican Cultural Institute is presented in conjunction with the Hirshhorn exhibition Rafael Lozano-Hemmer: Pulse, which will fill the Museum’s entire Second Level with immersive environments that use heart-rate sensors to create kinetic and audiovisual experiences from visitors’ own biometric data. Over the course of six months, Pulse will animate the vital signs of hundreds of thousands of participants. Yoko Ono is a renowned artist whose work influenced Feminism and directions in new and contemporary media. She has also worked tirelessly for human rights and peace. RELAX. 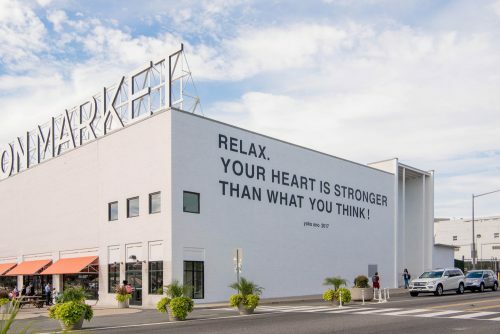 YOUR HEART IS STRONGER THAN WHAT YOU THINK !, a new public mural created for Washington, DC, transforms nearly 1,000 square feet of the exterior of the bustling Union Market into one of Ono’s signature textual artworks. Ono imagined the piece specifically for this location with the hope that it might compel us to step outside of our daily lives and consider the power of the heart over the restrictions of the mind. 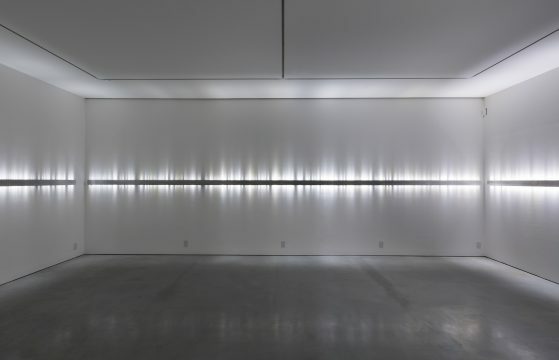 Since the late 1950s, Ono (b. Tokyo, 1933) has been a forerunner in Conceptual art, often using collaboration, audience participation, and social activism to challenge viewers’ understanding of art and the world around them. Many of her works serve as poetic reminders of what’s possible and often invite audiences to take action. Curated by Mark Beasley, the Hirshhorn’s Curator of Media and Performance Art, the mural is a culmination of the 2017 Hirshhorn exhibition Yoko Ono: Four Works for Washington and the World and celebrates the 10th anniversary of Ono’s Wish Tree, a permanent installation in the Museum’s year-round Sculpture Garden. Brand New SW is a public art project celebrating Washington’s innovative and collaborative art scenes. The Hirshhorn invited Washington-based artists No Kings Collective, NoMüNoMü, and SUPERWAXX to create branded graphic posters inspired by Brand New: Art & Commodity in the 1980s, an exhibition exploring the iconic decade when artists blurred the boundary between art and marketing. These limited-edition posters will be wheat-pasted, guerrilla style, around the public spaces of Southwest DC in early April, in homage to the underground art practices of the 1980s. 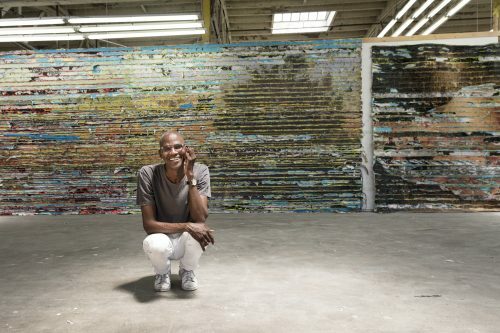 Following the debut of his monumental Hirshhorn commission Pickett’s Charge, 2017 Venice Biennale artist Mark Bradford will work closely with art students at Howard University to explore the ways that artists can probe history to uncover reflections of today’s society. For this collaboration, Bradford will guide students through a series of classes and public lectures. Throughout spring, commuters at L’Enfant Plaza Metro Station emerged from underground to find themselves in the middle of a large-scale public art installation. 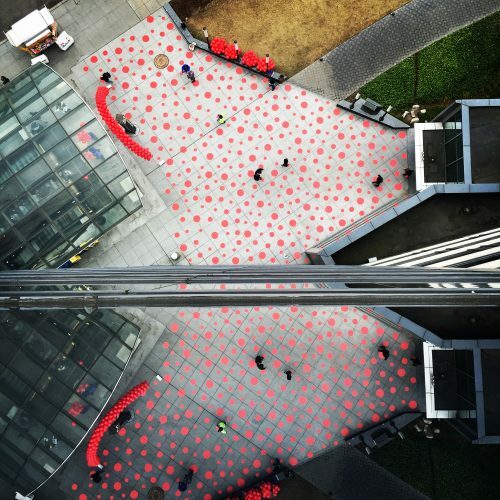 Psychedelic fields of Yayoi Kusama’s iconic dot patterns covered the Metro entrance in celebration of the arrival of Yayoi Kusama: Infinity Mirrors. The installation was the first partnership between the Hirshhorn and the ArtSW project of the Southwest Business Improvement District (SWBID).